The Cafe Restaurant Bar at Golden Beach is situated right opposite Tolo beach with spectacular sea and beach views. The Golden Beach Restaurant has recently been completely refurbished and has a crisp, modern appearance with natural colours and a sophisticated atmosphere. 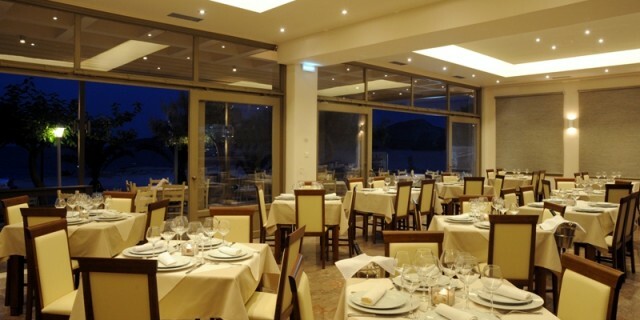 The restaurant serves traditional Greek home cooked food, salads, starters, snacks and sweets while the cafe serves beverages, drinks & coffees to both guests of the hotel and the general public with an extra take-away service for those wishing to take their purchases to the beach. Enjoy drinks overlooking the beach of Tolo early evening followed by a great meal with the island of Koronis lit up in the background, a light lunch during a beach break or a cool beer when leaving for the day… the Cafe Restaurant Golden Beach is at your service. The excellent food, friendly service and great atmosphere make the Golden Beach a great choice.